Tags: Cornish language, Cornwall, Cultural Traditions | Permalink. Before I left the house this morning I travelled to the other side of the isle, from North Cornwall to Norfolk in the company of Helen Macdonald. In an article published just before Christmas in the New Statesman she recounts her annual pilgrimage to the Wildfowl and Wetlands Trust reserve at Welney in Norfolk, the wintering site for thousands of whooper and Bewick’s swans. Her description of the spectacle is as vivid and original as anyone who has read her recent book H is for Hawk would expect. What does a thousand-strong chorus of Arctic swans sound like? Until this morning I couldn’t have told you, but through her words I can hear them now, I can hear what she calls a “vast amateur brass band tuning up in an aircraft hangar”. But what most caught my attention was something she expresses towards the end of the article: her delight, while watching the swans, that they are as at home in Norfolk as they are in the Arctic. Home. 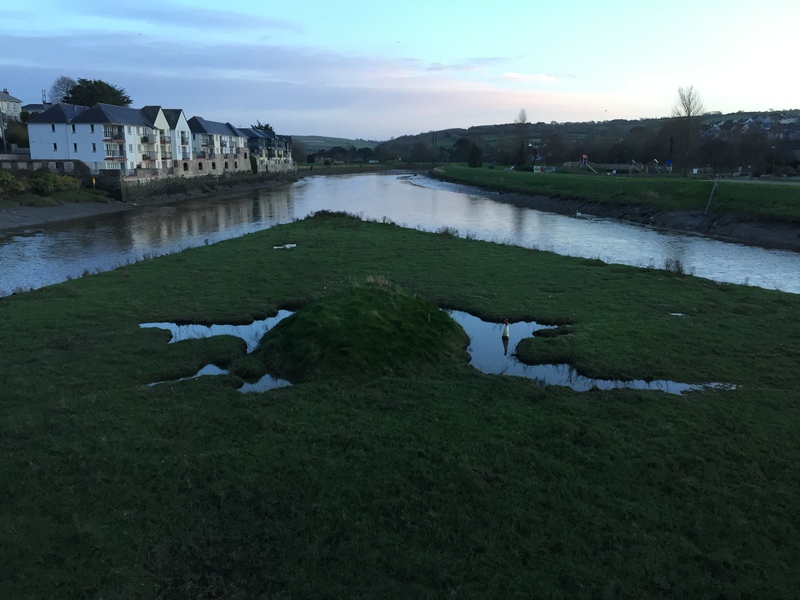 As a child growing up in Wadebridge, one of the things I loved was to stand on the bridge across the estuarine River Camel and watch the mudbanks re-emerge as the water receded with the ebb tide. There was something reassuring about their reappearance. The world may have seemed different for a while, but at bottom nothing had really changed. Best of all was the grassy mound that sat just upstream of the bridge, and onto which a pair of swans would regularly clamber and there wait patiently for the river to return. When I left home aged 19, the swans and the river were among the few things I acknowledged missing. 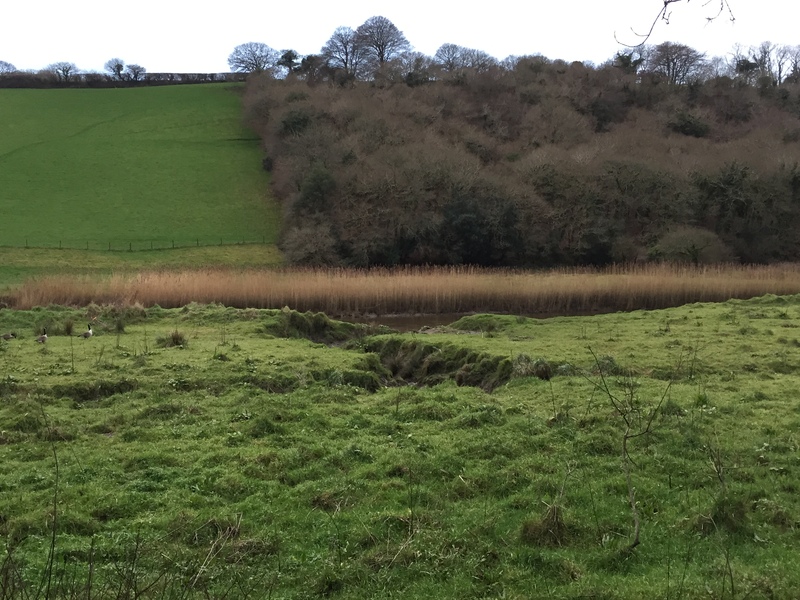 Today the afternoon skies are heavy and grey as Paloma and I set out upstream along the Camel Trail. We’re not planning to go far. We’ll walk until the light begins to fade, and then head back for tea. But that will be enough, for this is rich terrain that is best taken in small amounts that can be savoured. 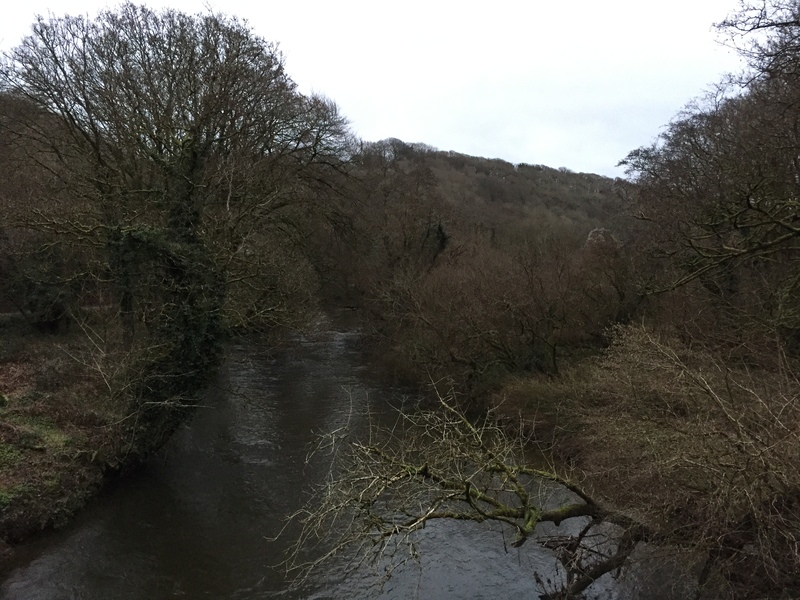 We follow a south-easterly line below Treraven Wood and begin to cross the meandering river at Pendavey Bridge, led on by a gentle honking. Reaching the midpoint of the bridge we see there are twenty or so Canada Geese pottering around the riverside. They seem as unmindful of me as I am of everything else as I stop to photograph them. The woodland opens and the water, now on our right, flows straight for a stretch, belying its original Cornish name, Dowr Kammel: crooked river. On the far side bank, the strip of filamentous grasses seems to shiver in time to our own movement, as if it were a sound waveform capturing the music of this place. 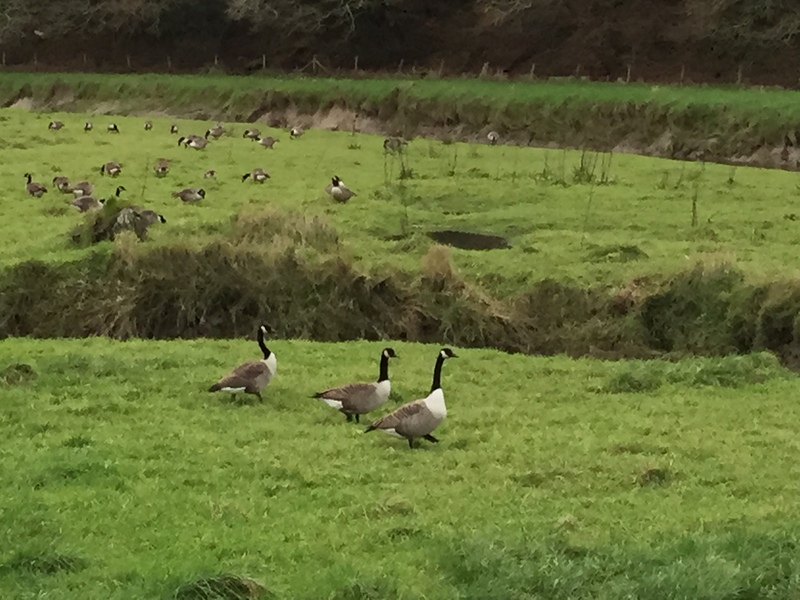 It is then we spot the second skein of geese and begin to hear and see their announcement of imminent flight. Honk waddle, honk waddle, honk waddle, honk honK hoNK hONK HONK HONK… “¡Qué escándalo!” says Paloma, and there is indeed a considerable racket as the birds take to the air and head downstream. Quiet returns, and we decide to press on for another ten minutes or so, as far as Polbrock. There we climb the steps up onto the narrow road that runs along the top of the twin-arch bridge: one arch spanning the disused railway line along which we have been walking, the other the river itself. From our new vantage point we gaze upstream and marvel. At this distance and shorn of leaves the trees are impossible, with our knowledge, to identify, yet they are no less beautiful in anonymity. What was it that the poet Neruda wrote in response to a world of too many names? Pienso confundir las cosas, I have a mind to confuse things. Or as one of my clinical supervisors used to say: Forget the diagnosis, listen to the patient! Sound advice, but not always easy to follow. And so, our vision prejudiced by training, we fill the lacunae with what we think we know. “See that tree there: don’t its branches look like Purkinje cells? And that spindly one to the right: isn’t that a motor neuron?” This is how we bring the anonymous trees into focus, by imagining the foundations of life. The light is fading now, and we need to head home. As we descend the steps and start back along the trail I think of how my father loved this place, and of how in leaner times he had fished this stretch to put food on the table. For him it was not just a place of recreation, it was somewhere that through care and respect would continue to provide. In his own way, that is what he communicated to us as children. I realize, then, what it was I had felt up there on the bridge. A sense of permanence. I quicken my step so as to catch up with Paloma, and together we stride out, hand in hand and singing into the dimming of the day. 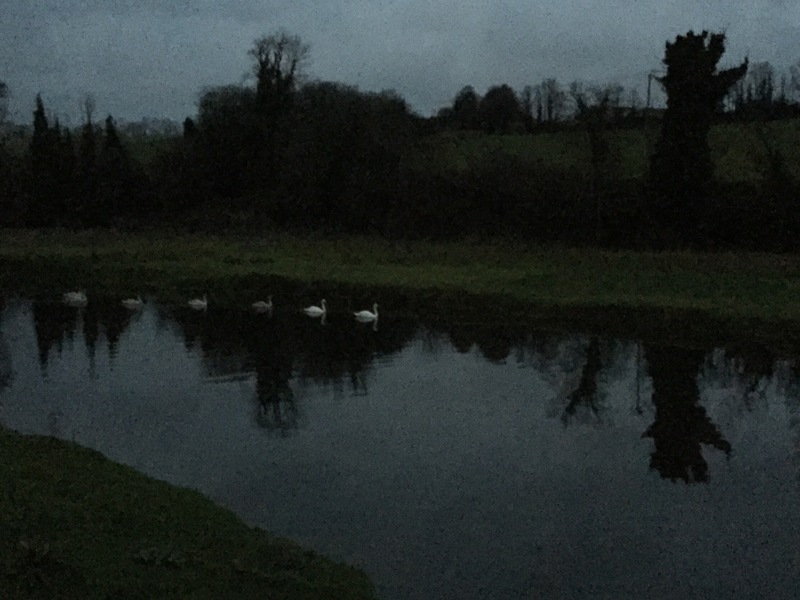 By the time we reach Pendavey Bridge it is almost dark, and that is why we almost miss them, there on the upstream side: six mute swans plopping patiently, one at a time, off the riverbank and into the rising water. A whiteness of swans. The collective noun is right in this light. Despite their name, swans of this species are not actually mute, although they would never pass the audition for an Arctic brass band. But they are the swans I know, and they are doing what the River Camel swans have always done. They are moving between land and water, between two homes. Tags: Birds, Castilian Spanish, Catalan, Cornish language, Cornwall, Helen Macdonald, Memory, Poets/Poetry, River Camel, Wadebridge, Writers | Permalink. The shade and sound of Kernow. 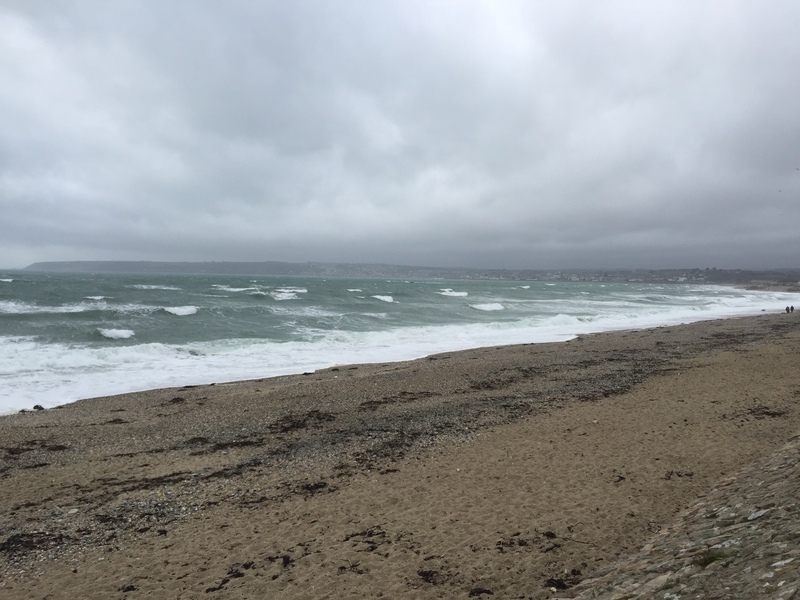 Tags: Cornish language, Cornwall, Memory, Sea & Shore | Permalink. Arles-sur-Tech is a small town at the eastern end of the French Pyrenees, and it is overshadowed to the north by the Canigó massif. These lands at the southernmost end of the Languedoc-Roussillon region have deep connections to Catalonia, both its language and traditions. On 23 June 1955, Francesc Pujades, a resident of Arles-sur-Tech, took it upon himself to continue a centuries-old European tradition by lighting a bonfire to mark the eve of St John’s Day. 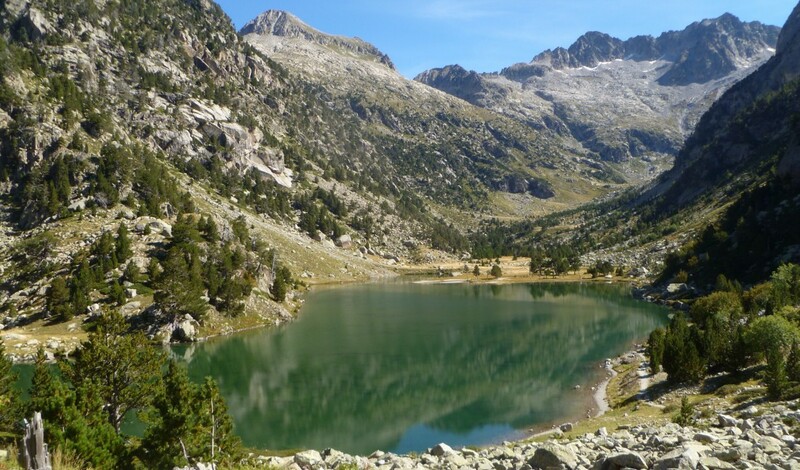 What made Pujades’ initiative stand out was that his fire burned at an altitude of 2,784 m, at the summit of the Canigó. The idea that followed was that a torch lit from the fire could serve as a mother flame, la flama, from which St. John’s fires could be lit in succession throughout the Catalan lands. As a symbol of a cultural identity that refused to be extinguished despite the prohibitions set in place by Franco’s dictatorship, la flama had considerable value, yet not until 1966 would the torch pass south of the Pyrenees. 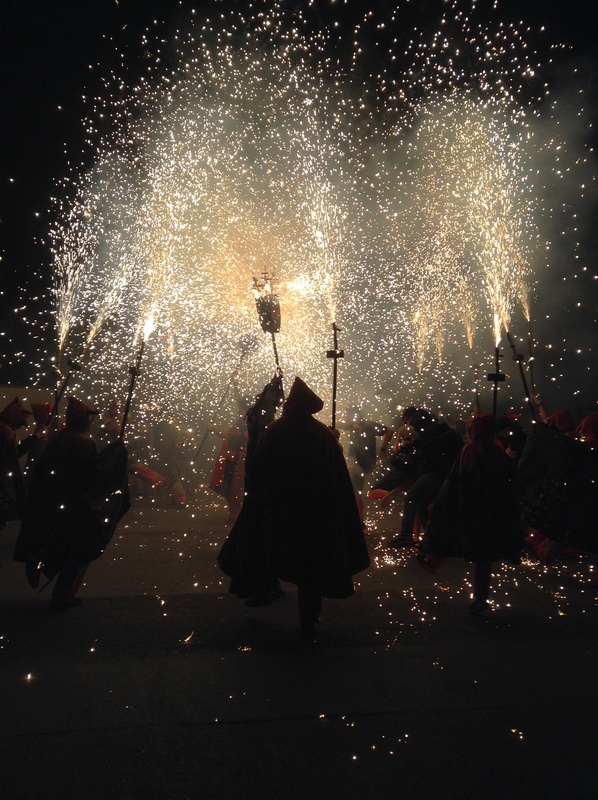 Today, however, la flama de Canigó is relayed freely throughout the land on both sides of the mountains, and St John’s Day is now a national holiday in Catalonia. As I walked home just before midnight on St John’s Eve, the streets around the main square of my Catalan hometown, Sant Pere de Ribes, were still alive to the sound of snappers, whistling rockets and conviviality. In contrast to the light and spark of the night before, the town awoke to slate-grey skies, and around midday an intense storm blew in over the Mediterranean, rinsing the air of the gunpowder perfume that had hung heavy into the early hours. When the storm cleared I went out to walk some of the trails that wind their way through the vineyards, scrub and woodland that surround Sant Pere de Ribes. 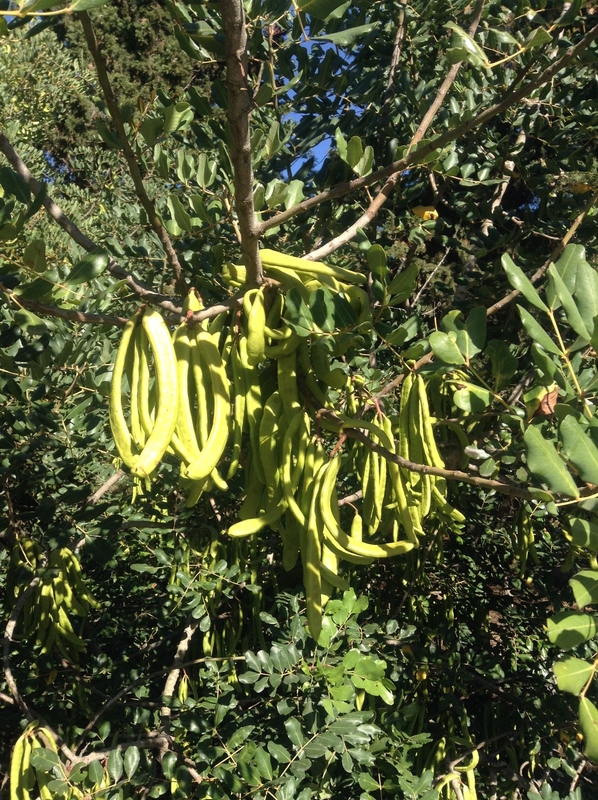 The dirt track I chose is lined to the west by carob trees, and at this time of year they are festooned with unripe glossy-green pods. As the carob is also known as St John’s bread it seemed fitting to be following this path on his feast day. It also felt good to be alone after so much companionship the previous evening. Alone, that is, except for the birds, who seemed to be relishing the freshness of the storm-swept air. To my left, finches gold and green flitted over and among the vines, while ahead of me on the path, swallows swooped back and forth like stray fireworks. The skies, however, had yet to clear, and maybe it was this, their colour, that turned my mind to Cornwall. St John’s fires would also have been lit in many towns across my homeland, most notably, perhaps, as part of the Golowan festivities in Penzance. In Cornish, the verb golowi means both to enlighten and to illuminate, from the noun golow, light. Until the end of the nineteenth century it was common for the Feast of St John to be celebrated in Cornwall with bonfires, flaming tar barrels and torches, but adminstrative anxiety over insurance claims doused these traditions, which only re-emerged in force during the 1990s. Nowadays, festivities last a whole week, from St John’s Eve right through to the Feast of St Peter on 29 June. As its name would suggest, my Catalan hometown of Sant Pere de Ribes also celebrates its annual festival on St Peter’s Day. So, barely a week after the St John’s festivities the streets were once again filled with the sound of fireworks and the hum of expectation. Before joining family for the traditional St Peter’s Eve supper I decided to retrace my steps from the previous week. The afternoon was much hotter this time, and I walked quickly past the carob trees with an eye on the shade offered by the small wood that lies at the head of the trail. 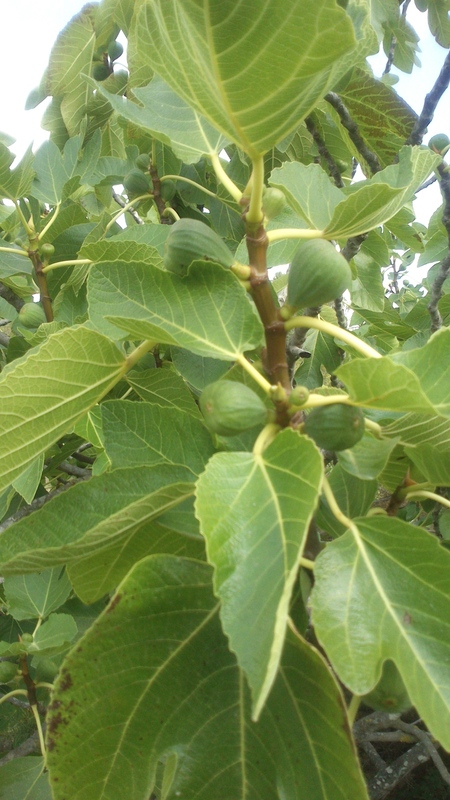 Just before I reached the cover of pine and holm oak I stepped off into the scrub to inspect what is a dispenser of sweet carnality to all who walk this path in early September, a gnarled old fig tree. Now, in June, however, only green gobstoppers clung to its branches. I pressed on into the wood and was glad that it offered a shaded path back down to the edge of town where my in-laws live. I reached their house just as the final guests were arriving, so I quickly showered and joined the party for an al fresco supper of cured ham, stuffed omelettes and grilled sardines, followed by a traditional sweet flatbread washed down with a bottle of Cornish sparkling wine that I had been saving for the occasion. As night closed in we waited expectantly for the aerial maroon that would signal the ten-minute countdown. As my in-laws house sits on the western permiter of town it offers a perfect vantage point from which to enjoy the firework display that is launched each year from the tenth-century castle nearby. On the stroke of 11 the first rocket was fired into the air, and for the next twenty minutes the skies were filled with willows and palms, serpents and strobes. The best, however, was yet to come, as the centrepiece of the St Peter’s festivities is a diabolic street parade culminating in the main square. Hessian-clothed and hooded demons of all ages take to the streets, holding aloft staffs from which fountains of fire shower sparks upon the expectant onlookers. The first time you witness it, it all appears quite mad. As I watched the parade I wondered whether next year I might spend these days in Penzance or in one of the other Cornish fishing communities that mark the Feast of St Peter, their patron, with bonfires. I remembered, then, something I had read back in March on the BBC News website. The item described how the only complete copy of the Catholicon Anglicum, a fifteenth-century Middle-English–Latin dictionary had been purchased by the British Library in order to save it from export to a private collection. Interestingly, one of the entries in this dictionary refers to ‘ban fyre, ignius ossium’, the bone-fire from which our modern bonfire is derived. As a young child I had encountered a similar Latin expression, fragilitis ossium, which for all its apparent authority did nothing to help me understand why my bones broke so much more easily than those of other children. The modern term for brittle bone disease, osteogenesis imperfecta, captures more of the problem, since we now know that the fragility is caused by a genetic defect that affects bone formation. Bone is a composite of two materials, a mineral called hydroxyapatite (a form of calcium phosphate) and the protein collagen. In brittle bone disease it is the latter which is deficient, either in quality or quantity, or both. Collagen is important as it gives bones a degree of flexibility, while the job of the mineral hydroxyapatite is to provide a complementary hardness. Too much collagen and our bones would be rubbery; too little or poor quality collagen and they become fragile. As in so much of life, balance matters. A summer of too many wildfires can cause lasting damage to the scrub and woodland landscapes that surround my Catalan hometown, yet its people nonetheless turn to fire as a way of celebrating the feast days of St John and St Peter. For those who lived through Franco’s dictatorship it is a reminder, perhaps, that they now live in more enlightened times. Tags: Bones, Canigó, Catalonia, Cornish language, Cornwall, Cultural Traditions, Golowan, Pyrenees, Sant Pere de Ribes, St John, St Peter, Trees | Permalink.